The Winter Vegetarian takes its recipes from regions all over the globe, offering insight into the winter lore and wisdom of different cultures. 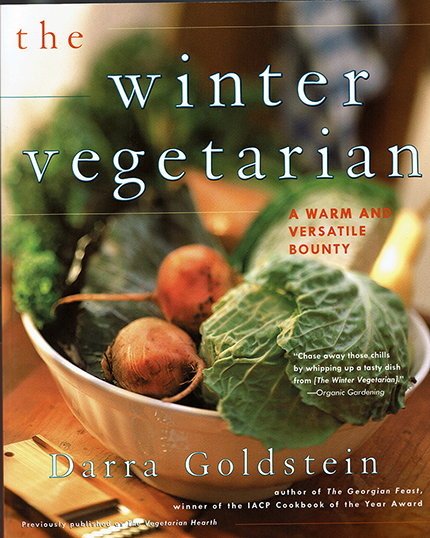 Distinguished cookbook author Darra Goldstein shows us how to conjure the “deep pleasures and secret excitement” of winter, even with farmers’ markets shut down and fresh produce so hard to come by. Goldstein’s winter is one of cheese baked in grape leaves; spicy winter crudités; rutabagas roasted in the fireplace; and bracing hot toddies steeped all day with apples in a crock next to the fire.